Location: Grifid Encanto Beach is located on the beach just 10 m from the sea in Golden Sands resort. The center of the resort is 1500 m from the hotel. There is a shopping center 800 m away and a bus stop 500 m away. 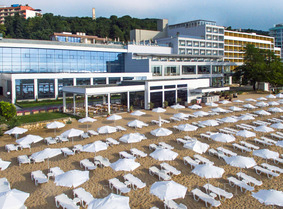 The hotel is situated 15 km from Varna and 35 km from Varna Airport. Accommodation: The hotel offers 252 rooms - double standard and family rooms completely renovated in 2017. Most of the rooms offer magnificent sea view. The rooms feature carpet floor or tiles, balcony, satellite TV, in room safe (extra charge), free Wi-Fi, bathrooms with bathtub; hairdryer; shower in family rooms; mini bar service. main restaurant with enlarged open-air terrace overlooking the sea and a-la-carte restaurant for dinner (reservation required). There are 5 bars - Snack bar on the beach; Beach bar; Lobby bar with open air terrace; Sky bar with magnificent sea view; Night bar.